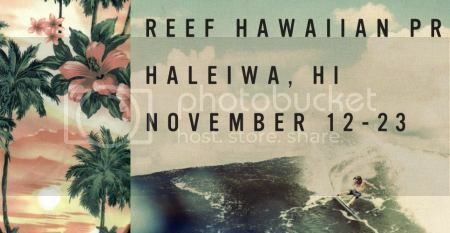 Reef Hawaiian Pro the first jewel of the Vans Triple Crown runs November 12th - 23rd at Haleiwa , Oahu. Adam Melling and Stu Kennedy will be there . Adam has comfortably requalified for the WCT for 2014 while Stuey is a real shot at cracking the CT too. Good luck fellas. SWELL/SURF: Conservatively solid overhead to double overhead+ surf, with larger sets very possible and likely. Stay tuned, storm dependent. WIND: NE 6-11kts. SWELL/SURF: Solidly overhead to double overhead+ with bigger sets still possible. Stay tuned, storm dependent. WIND: ENE 5-10kts. Potential for afternoon sea breeze. Stay tuned. SWELL/SURF: Still potential for well overhead surf in the morning. Again, stay tuned as we will have more refined details as the storm develops in the next couple days. WIND: Possible light/variable and potential for seabreeze in the afternoon. Stay tuned. SWELL/SURF: Still looks pretty fun and very contestable with surf in the head high range possible. Stay tuned. WIND: Light/variable trades. Stay tuned. Stu was ripping in his round of 96 heat but was unfortunately taken out in the last second by Matt Banting. Adam was loose and busy in the tiny conditions and easily progressed into the round of 32. No luck for Mello today, eliminated by 0.17 and finishing 17th. Bring on Sunset.